An application may be required to perform a variety of tasks of varying complexity on the information that it processes. A straightforward but inflexible approach to implementing this application could be to perform this processing as monolithic module. However, this approach is likely to reduce the opportunities for refactoring the code, optimizing it, or reusing it if parts of the same processing are required elsewhere within the application. Figure 1 illustrates the issues with processing data by using the monolithic approach. An application receives and processes data from two sources. The data from each source is processed by a separate module that performs a series of tasks to transform this data, before passing the result to the business logic of the application. 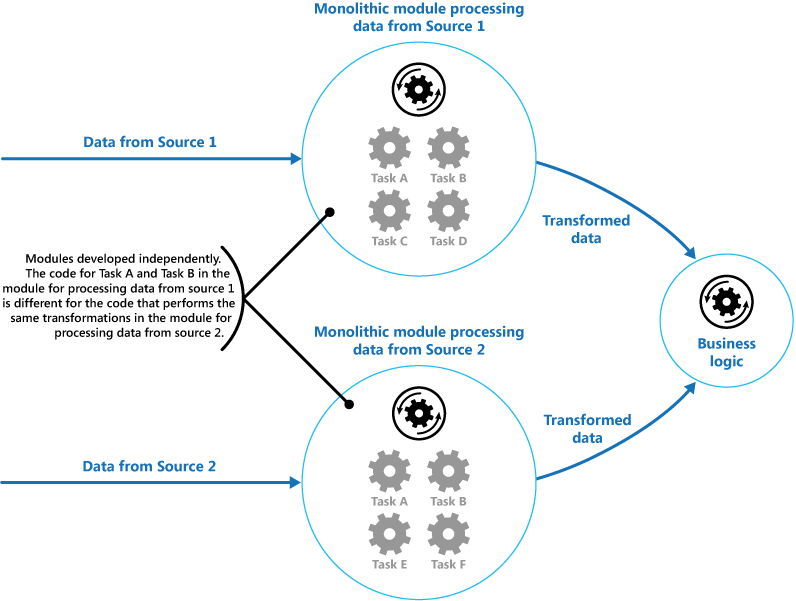 Some of the tasks that the monolithic modules perform are functionally very similar, but the modules have been designed separately. The code that implements the tasks is closely coupled within a module, and this code has been developed with little or no thought given to reuse or scalability. However, the processing tasks performed by each module, or the deployment requirements for each task, could change as business requirements are amended. Some tasks might be compute-intensive and could benefit from running on powerful hardware, while others might not require such expensive resources. Furthermore, additional processing might be required in the future, or the order in which the tasks performed by the processing could change. A solution is required that addresses these issues, and increases the possibilities for code reuse. Decompose the processing required for each stream into a set of discrete components (or filters), each of which performs a single task. By standardizing the format of the data that each component receives and emits, these filters can be combined together into a pipeline. This helps to avoid duplicating code, and makes it easy to remove, replace, or integrate additional components if the processing requirements change. Figure 2 shows an example of this structure. The time taken to process a single request depends on the speed of the slowest filter in the pipeline. It is possible that one or more filters could prove to be a bottleneck, especially if a large number of requests appear in a stream from a particular data source. A key advantage of the pipeline structure is that it provides opportunities for running parallel instances of slow filters, enabling the system to spread the load and improve throughput. The filters that comprise a pipeline can run on different machines, enabling them to be scaled independently and can take advantage of the elasticity that many cloud environments provide. A filter that is computationally intensive can run on high performance hardware, while other less demanding filters can be hosted on commodity (cheaper) hardware. The filters do not even have to be in the same data center or geographical location, which allows each element in a pipeline to run in an environment that is close to the resources it requires. Figure 3 shows an example applied to the pipeline for the data from Source 1. If the input and output of a filter are structured as a stream, it may be possible to perform the processing for each filter in parallel. The first filter in the pipeline can commence its work and start to emit its results, which are passed directly on to the next filter in the sequence before the first filter has completed its work. Another benefit is the resiliency that this model can provide. If a filter fails or the machine it is running on is no longer available, the pipeline may be able to reschedule the work the filter was performing and direct this work to another instance of the component. Failure of a single filter does not necessarily result in failure of the entire pipeline. Using the Pipes and Filters pattern in conjunction with the Compensating Transaction pattern can provide an alternative approach to implementing distributed transactions. A distributed transaction can be broken down into separate compensable tasks, each of which can be implemented by using a filter that also implements the Compensating Transaction pattern. The filters in a pipeline can be implemented as separate hosted tasks running close to the data that they maintain. Complexity. The increased flexibility that this pattern provides can also introduce complexity, especially if the filters in a pipeline are distributed across different servers. Reliability. Use an infrastructure that ensures data flowing between filters in a pipeline will not be lost. Idempotency. If a filter in a pipeline fails after receiving a message and the work is rescheduled to another instance of the filter, part of the work may have already been completed. If this work updates some aspect of the global state (such as information stored in a database), the same update could be repeated. A similar issue might arise if a filter fails after posting its results to the next filter in the pipeline, but before indicating that it has completed its work successfully. In these cases, the same work could be repeated by another instance of the filter, causing the same results to be posted twice. This could result in subsequent filters in the pipeline processing the same data twice. Therefore filters in a pipeline should be designed to be idempotent. For more information see Idempotency Patterns on Jonathan Oliver’s blog. Repeated messages. If a filter in a pipeline fails after posting a message to the next stage of the pipeline, another instance of the filter may be run (as described by the idempotency consideration above), and it will post a copy of the same message to the pipeline. This could cause two instances of the same message to be passed to the next filter. To avoid this, the pipeline should detect and eliminate duplicate messages. If you are implementing the pipeline by using message queues (such as Microsoft Azure Service Bus queues), the message queuing infrastructure may provide automatic duplicate message detection and removal. Context and state. In a pipeline, each filter essentially runs in isolation and should not make any assumptions about how it was invoked. This means that each filter must be provided with sufficient context with which it can perform its work. This context may comprise a considerable amount of state information. The processing required by an application can easily be decomposed into a set of discrete, independent steps. The processing steps performed by an application have different scalability requirements. It may be possible to group filters that should scale together in the same process. For more information, see the Compute Resource Consolidation pattern. Flexibility is required to allow reordering of the processing steps performed by an application, or the capability to add and remove steps. The system can benefit from distributing the processing for steps across different servers. A reliable solution is required that minimizes the effects of failure in a step while data is being processed. The processing steps performed by an application are not independent, or they must be performed together as part of the same transaction. The amount of context or state information required by a step makes this approach inefficient. It may be possible to persist state information to a database instead, but do not use this strategy if the additional load on the database causes excessive contention. You can use a sequence of message queues to provide the infrastructure required to implement a pipeline. An initial message queue receives unprocessed messages. A component implemented as a filter task listens for a message on this queue, performs its work, and then posts the transformed message to the next queue in the sequence. Another filter task can listen for messages on this queue, process them, post the results to another queue, and so on until the fully transformed data appears in the final message in the queue. If you are building a solution on Azure you can use Service Bus queues to provide a reliable and scalable queuing mechanism. The ServiceBusPipeFilter class shown below provides an example. It demonstrates how you can implement a filter that receives input messages from a queue, processes these messages, and posts the results to another queue. The ServiceBusPipeFilter class is defined in the PipesAndFilters.Shared project in the PipesAndFilters solution. This sample code is available is available for download with this guidance. The Start method in the ServiceBusPipeFilter class connects to a pair of input and output queues, and the Close method disconnects from the input queue. The OnPipeFilterMessageAsync method performs the actual processing of messages; the asyncFilterTask parameter to this method specifies the processing to be performed. The OnPipeFilterMessageAsync method waits for incoming messages on the input queue, runs the code specified by the asyncFilterTask parameter over each messages as it arrives, and posts the results to the output queue. The queues themselves are specified by the constructor. The sample solution implements filters in a set of worker roles. Each worker role can be scaled independently, depending on the complexity of the business processing that it performs or the resources that it requires to perform this processing. Additionally, multiple instances of each worker role can be run in parallel to improve throughput. The following code shows a Azure worker role named PipeFilterARoleEntry, which is defined in the PipeFilterA project in the sample solution. This role contains a ServiceBusPipeFilter object. The OnStart method in the role connects to the queues for receiving input messages and posting output messages (the names of the queues are defined in the Constants class). The Run method invokes the OnPipeFilterMessagesAsync method to perform some processing on each message that is received (in this example, the processing is simulated by waiting for a short period of time). When processing is complete, a new message is constructed containing the results (in this case, the input message is simply augmented with a custom property), and this message is posted to the output queue. The sample code contains another worker role named PipeFilterBRoleEntry in the PipeFilterB project. This role is similar to PipeFilterARoleEntry except that it performs different processing in the Run method. In the example solution, these two roles are combined to construct a pipeline; the output queue for the PipeFilterARoleEntry role is the input queue for the PipeFilterBRoleEntry role. The sample solution also provides two further roles named InitialSenderRoleEntry (in the InitialSender project) and FinalReceiverRoleEntry (in the FinalReceiver project). The InitialSenderRoleEntry role provides the initial message in the pipeline. The OnStart method connects to a single queue and the Run method posts a method to this queue. This queue is the input queue used by the PipeFilterARoleEntry role, so posting a message to this queue causes the message to be received and processed by the PipeFilterARoleEntry role. The processed message then passes through the PipeFilterBRoleEntry role. The input queue for the FinalReceiveRoleEntry role is the output queue for the PipeFilterBRoleEntry role. The Run method in the FinalReceiveRoleEntry role, shown below, receives the message and performs some final processing. Then it writes the values of the custom properties added by the filters in the pipeline to the trace output. Competing Consumers Pattern. A pipeline can contain multiple instances of one or more filters. This approach is useful for running parallel instances of slow filters, enabling the system to spread the load and improve throughput. Each instance of a filter will compete for input with the other instances; two instances of a filter should not be able to process the same data. The Competing Consumers pattern provides more information on this approach. Compute Resource Consolidation Pattern. It may be possible to group filters that should scale together into the same process. The Compute Resource Consolidation pattern provides more information about the benefits and tradeoffs of this strategy. Compensating Transaction Pattern. ****A filter can be implemented as an operation that can be reversed, or that has a compensating operation that restores the state to a previous version in the event of a failure. The Compensating Transaction pattern explains how this type of operation may be implemented in order to maintain or achieve eventual consistency.